Miller Garden - 2011/03/11 - Chiyoko & Guy's Photo Site. Friday March 11th & a trip to the Miller Botanic Garden again for the Spring Great Plant Picks Meeting. The Hepatica Collection was out in it's full glory. Other plants of interest on this trip we the Arctostaphylos densiflora 'Howard McMinn' for it's cool branch stucture. The narrow leaved Aucuba acutifolia, Euonymus fortunei 'Wolong Ghost' that was actually starting to climb and the cool bark of Quercus suber to name just a few. 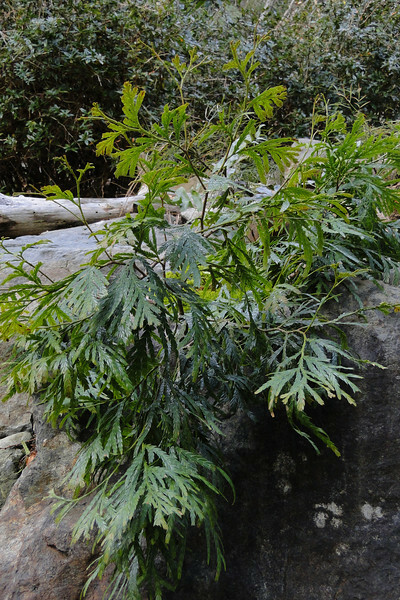 Fokienia hodginsii The only species in it's Genus this rare Chinese Conifer can apparently grow to a 100' in the wild but often behaves more like a rock garden plant in Western gardens!